Funeral Masses are at 11.00 a.m. and there is no 10.00 a.m. Mass on the day of a funeral). The following is a brief history of our Parish. It is intended to outline the features that make St. Brendan’s’ a unique place of worship for parishioners and visitors alike. The history follows the development of the building under the guid­ance of its successive Parish Priests. By the beginning of the 19th Century it was clear that the Catholic Church located in the present Mill Street was in a poor structural condition. Thus plans were drawn up for the present St. Brendan’s Church. Bernard Mullen was appointed architect and Michael McDonnell engraver. The 2nd Earl of Rosse donated the site and his son Lord Oxmantown (the future famous astronomer) laid the foundation stone, on August 1st, 1817. Built in gothic style the church is in the shape of a Latin Cross. Its spire extends to 124 feet 6 inches and is surmounted with a Greek cross. The building of the church was completed on the 1st August 1824 but much interior work still remained unfinished. This makes it one of the oldest churches in the Killaloe Diocese. Dr. Kennedy became Parish Priest of the new Church in 1826. This unfortunately coincided with theheight of the Kennedy Plaque`Crotty Schism’. His appointment was perhaps not the most diplomatic as his brother was a member of the ‘Church Committee’ the body Fr. Crotty conducted most of his campaign against. During Dr. Patrick Kennedy’s time in 130 one of Fr. Crotty’s supporters threw a stone breaking the key held by the image of St. Peter above the main door, the damage is still evident to this day. Following the death of Bishop O’Shaughnessy, Fr. Patrick Kennedy was appointed Bishop of Killaloe. He remained resident in the Parish and is buried at the south side of the altar. The Diocesan Priests erected a plaque at the site of his grave. The appointment of Fr. John Spain led to the second phase in St. Brendan’s devel­opment. He extensively remodeled the church adding the galleries and the building’s greatest treasure the west-facing window behind the high AltarJohn Spain Plaque. This is especially precious, as Augustus Welby Northmore Pugin (architect of London’s Houses of Parliament) designed it. It was manufactured in Newcastle-on-Tyne, packed in crates, protect­ed by straw and transported to Birr. It was installed in 1842 as the stone above the window signifies. This according to Monsignor Ignatius Murphy’s `History of the Diocese of Killaloe’ makes it the oldest stain glass window in the Diocese. Fr. Spain also invited the Sisters of Mercy to the town. Their founder Ven. Catherine McAuley attended Mass in the church during the winter of 1840-1841. Fr. Spain died of fever in 1848 and is buried at the north side of the altar. The altar was erected as a memorial to Fr. Egan. His grave slab is visible on the left of the side aisle. The reredos and window of the Resurrection are memorials to Dean Bugler. He brought the Presentation Brothers to Birr. He also purchased the Parochial House in 1872. In 1892 the Presbytery was acquired. During Archdeacon Phelan’s time the practice of burying priests in the church was discontinued. Bishop McRedmond blessed the Priest’s Cemetery on 11th October 1902 (Archdeacon Phelan was the 1st Priest buried there). A stain glass window depicting St. Brendan was installed in his memory. The pitch pine parquet church floor was installed in 1898. Archdeacon Phelan was in poor health during his time in Birr. Major renovations costing £7,200 were carried out by Dean Scanlon between 1910 and 1917. W.H. Byrne, Dublin was Architect for the project. It is interesting today to examine the costs of building at the time. The following works were carried out: Repairs to a stone pinnacle by Daniel Carroll (Seffin), D. P. Hoctor (Green Street) main contractor was paid £3,378. McLaughlin’s (Dublin) carried out work to the ceiling, steel roof supports were installed costing £1,800, Joseph Egan (Chapel Lane) pointed the exterior walls for £140, Gas lighting £160, 8 large and 4 small cut -stone windows £910, Hodginson (Limerick) painting and decoration £406, roof and ventilation £152. During Msgr Ryan’s 31 years in Birr electric light was installed in St. Brendan’s in 1921. Following a malicious fire on St. Patrick’s Day in 1935, the wooden altar steps were replaced with Caen stone. The timber sacristy floor was replaced with an oak parquet floor and the mosaic floor laid inside the altar rails. His funeral in 1948 was the second last time a horse hearse was used in Birr. He was 95 years old. Msgr Quinn cleared the trees in the chapel yard. He also removed the pine porch inside the main entrance. The four confessionals were recessed during 1951 – 1952. Robinson, Keefe & Devane were the architects for this job as they were in 1955 when the two cut stone porches were erected at the cost of £9,000. The northern porch became the Baptistery, with the first baptism there in July 1957. 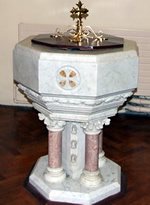 The mar­ble font previously in the front hall was converted to a baptismal font. This replaced the stone font in the hallway of the organ gallery stairs. Originally the mortuary served as a baptistery, before the custom of bringing remains to the church on the evening before burial was established. The present organ was erected by Rooney & Coffey in 1953 and blessed by Bishop Rogers. The world famous organist Mlle. Jeanne de Mesieux gave the recital on the occasion. The Leinster Regiment window on the gallery was installed in 1963. Msgr. Quinn died suddenly in Ennis following the `Month’s Mind Mass’ of Bishop Rogers. Leaving Birr without a Parish Priest for over 12 months until the appointment of Bishop Michael A. Harty, who appointed Monsignor P.J. Hamell as Parish priest. Following Vatican 11 Msgr. Hamell working with the parish Council carried out major renovations (1970/1971) to accommodate the necessary liturgical changes. Robinson, Keefe and Devane were the architects to the project. After a consulta­tion process Parishioners requested the preservation of the High Altar. The altar table was moved forward from the tabernacle, allowing the celebrant to face the congregation. Interestingly in his `Picture of Parsonstown’ (1826) Thomas Lawlor Cooke complained that the orientation of the building was wrong, as the priest faced West instead of East when celebrating Mass. Ironically the changes made in 1971 left the priest facing east for the celebration of Mass. Other works carried out at this time included the removal of the side altars. The pulpit was removed from its pedestal and relocated on site of the southern side of the altar. The Celebrant’s chair was located on the site of the northern side of the altar. New roof ventilation was installed and the pine rail separating the side aisles form the centre aisle removed. Dry lining of the walls, a new heating system and a creation of a ‘crying room’ completed the project. Bishop Michael A. Harty rededicated the church on April 22nd 1971. We are extremely lucky the work carried out during this period was so sensitively accomplished, at a time when so many churches had wonderful features removed. Msgr. Hamell was the first Parish Priest to retire on reaching the age of 75 years.­ He celebrated the Diamond Jubilee of his ordination with a special mass in St. Brendan’s in June 1995. His death occurred unexpectedly in the early hours of Sunday November 29th, 1998 (The feast of St. Brendan). It was also the 1st Sunday of Advent and the 31st anniversary of Msgr. Hamell’s arrival in Birr. He was in his 88th year. By the late 1980′s it was apparent the sacristy area was no longer adequate to accommodate the needs of a modern parish. Parish Council meetings, counting of collections, choir practices etc were taking place in a dilapidated old prefab locat­ed behind the church. Canon Shalloo and the Parish Council decided to remedy this situation. The Architectural firm McMahons of Limerick was com­missioned to design a new Priest’s Sacristy, Conference Room, office, kitchen and public toilets. The main contractor was Hogan & Wolfe. The building was built in cut stone, with gothic windows and natural slates to compliment the church building. The stairs to the side galleries were also installed at this time. This project cost over £200,000 and has greatly enhanced the facilities of St. Brendan’s Church. The Baptistery was converted to a ‘Eucharistic Adoration Room’ in 1997. Canon Shalloo retired as a Parish Priest in July 1999, having celebrated the Golden jubilee of his ordination the previous month. He passed to his eternal reward on February 8th 2006, after twenty years of faithful service to the people of the parish. In early 2000 the ‘Building Committee’ commissioned Michael Punch (Engineer) to survey the fabric of the church building.Baptism Font As suspected his report indicated the church roof was in very poor condition with many slates loose mid ready to become dislodged in the near future. The church was also in need of rewiring to meet mod­em health and safety standards. Fr. Tony Cahir in consultation with the Parish Council decided these works must begin as soon as possible to protect this church’s magnificent vaulted ceiling. Gordon Campbell was engaged as quantity surveyor and a full list of necessary works compiled. This included the refurbishment of two confessionals, complete rewiring and repainting of the church, refurbishment of seats and kneelers. The total cost of the project came to £350,000. The Parish Finance Committee had access to £200,000 leaving the Parish Council with the task of raising £150,000. Jerry O’Meara & Sons were appointed main contractors for the project. During the building work the marble baptismal font was moved from the Adoration Chapel to the Northern side aisle. A new brass rail now fronts each gallery. The refurbishment of the Church of the Annunciation also took place during Fr Tony’s term as Parish Priest. New locally-made windows were installed and the interior was re-wired and painted. New sanctuary elements were installed. Fr Tony also over-saw the development of the Garden of Tranquility. Parishioners erected the present altar as a memorial to Fr. John Egan P.P, who died in 1870. It is carved in Caen stone and decorated with red and green marble pillars. Parishioners in memory of Dean Michael Bugler who died in 1893 erected the rere­dos. John C. O’Neill donated the marble communion rail in memory of his wife Ellen, who died in October 1888. The centre section including the gates was removed during the renovations in 1970/1971. On the northern side gallery you will find a plaque inscribed `The gift of Rev, John Spain, rector and the Parishioners of Birr to Bernard Mullins, Ballyeigan House Esq. AD 1840’. We may conclude this side box overlooking the altar was the church architect’s personal seat. The present bell dates from 1890. It holds the inscription ‘Eire go brea’ and is dec­orated with harps and shamrocks. It was electrified in the early 1980′s. An interesting stone in the yard remembers John Mahon who died in November 1882. He was thirty years sacristan in St. Brendan’s. It also commemorates Michael May, ‘A Very Holy Man’ who died 12th December 1847, aged 88 years. The many stained glass windows were added between the 1890′s and 1960′s. They add great beauty to the building. Each is an individual work of art. The donors had each inscribed with the names of family members they wished to remember. The clock manufactured by Donegans Dublin was electrified during the 1990′s. The Parish records date back to 1836. Baptism, Confirmation and Marriage records are currently being transferred to a computerised system for easier access to the records. As already mentioned John O’Neill donated the communion rail in his wife Ellen’s memory. He also erected the magnificent Celtic cross near the organ gallery entrance in her memory. He was involved in the purchase of the Presbytery in 1891/1892. During Archdeacon Phelan’s time the practice of burying priests in the church was discontinued. Bishop McRedmond blessed the Priest’s Cemetery on 11th October 1902 (Archdeacon Phelan was the 1st Priest buried there). Located on the right-hand side of the Church. Located adjacent to the car park at the rear of the Church is the final resting place of many of the Sisters of Mercy nuns who served in Birr. 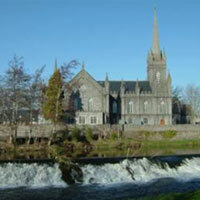 The Convent was located adjacent to the Church until it was restored and is now the Birr Library and Civic Offices. There are still a few Sisters of Mercy nuns in Birr, they are now living in McCauley Drive and Riverside. This house was first leased by John N. Stothard from the Earl of Rosse on 25th January 1849. It was purchased from the Earl of Rosse by Dean Michael Bugler on 18/07/1872. The sale was registered in the land Registry in Dublin at 3 minutes past 3 o’clock on 17/12/1872. This house was registered under the name of Amyrald Dancer on 30/07/1873, Richard Wallace purchased it from Amyrald Dancer on 22/10/1878. John C. O’Neill purchased the building from John Wallace on 23/12/1891. Finally on 13/02/1892 John C. O’Neill transferred the house to Dr. McRedmond Bishop of Killaloe. In March 2000 a bungalow was purchased at Woodlands Park for the retired Parish Priest. 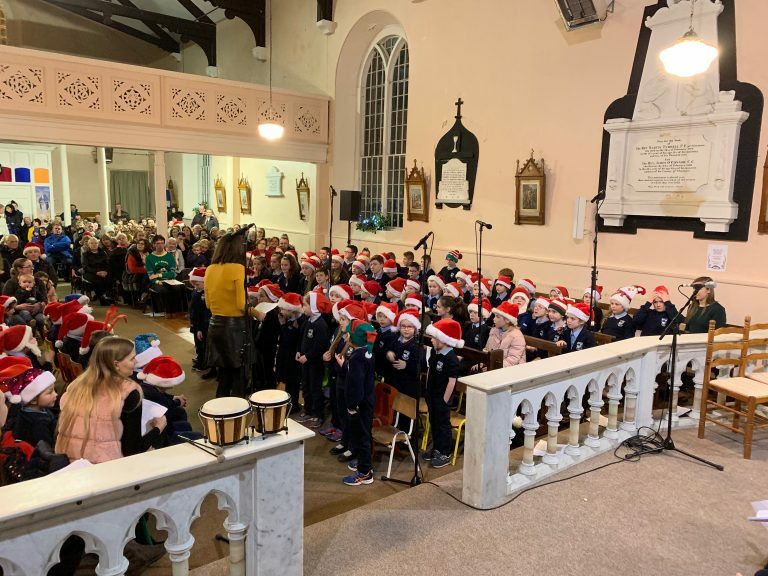 The Parish of Birr values and encourages the participation of children and young people in parish liturgies and activities that enhance their spiritual, physical, emotional, social and intellectual development, and will work in a partnership way with parents at all times.